Early 1930s - an airfield is created on the plateau above Saint-Hubert. December 1933 - following the sig­ning of a long lease with the town, M. Orta (Belgian army captain, aviator and the aero­drome manager) establishes a flight school and engineering workshops that produce Le Saint-Hubert, a 135 hp aircraft flying at 248 km/h and an observation aircraft Le Renard. 1946 - M. Orta hands over the lease and the management of Saint-Hubert Aerodrome to the Belgian State. In 1948, the Régie des Voies Aériennes (RVA), following its creation, takes over the responsibility from the Belgian State. 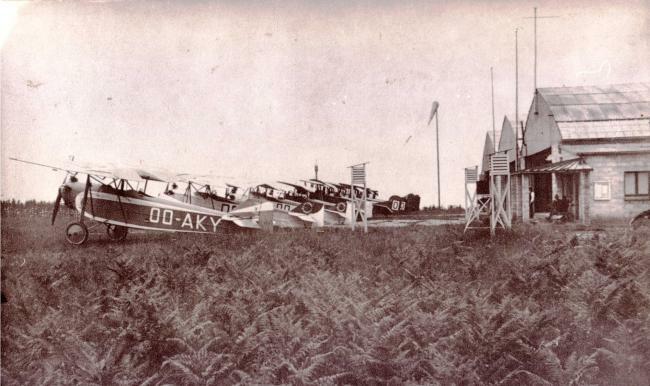 1958 - the Ardennes Flight Club is founded, they are the first to fly gliders from the aerodrome. 1960 - the National Gliding Centre leaves Temploux (Namur) for its new home in Saint-Hubert. August 1992 - all property, rights and obligations of the RVA are regionalised. The Ministry of Works and Transport (now the Public Service of Wallonia) assumes the aeronautical operations and control functions of the site. Tasks relating to the safety of Belgian airspace, initially the responsibility of the RVA, remain under federal jurisdiction: thus Belgocontrol continues to manage various facilities at Saint-Hubert to this day (emission and reception centres, goniometers, etc.). 2003 - the Walloon Government entrusts the management of infrastructures of three public aerodromes, Saint-Hubert, Spa-La Sauvenière and Cerfontaine, to the Société wallonne des aéroports S.A. (abbreviated SOWAER). 2004 - the Sowaer creates a specialised subsidiary: the S.A. Société de Gestion de Aérodrome de Saint-Hubert. Its role: to operate the site and ensure its commercial and touristic development. The Public Service of Wallonia has continued to be in charge of the commandment, aviation management and maintenance of the site as part of a memorandum of agreement with the Société de Gestion. Spring 2009 - considering its importance as a tool for the development of the Province of Luxembourg, Idelux decides to take over the management of the aerodrome. Décembre 2013 – Following a desagrement with several users, Idelux abandons the airfield. 2014 – The city of Saint-Hubert, the SOWAER, and the users unites to form a cooperative society to operate the airfield.